Preventing genocide is not always successful. But this time, by closing its borders, Europe has ensured that the necessary palliative care is also limited to the minimum. A Syrian man pulls their belongings after he was evacuated with his family from Aleppo, near Idlib, Syria. Picture by AP/Press Association Images. All rights reserved In 1989 the west turned out to have won the Cold War. A new world order was announced, and nothing less than the end of history was predicted. However, the victors left a trail of chaos and violence in places like Iraq, Afghanistan, and Libya. They had no clue what to do with their victory. The war in Syria marks a new low point. The siege of Aleppo can be closely followed on twitter and with videos uploaded on the internet. A few months ago, a video was circulating with images taken from a drone hovering over the devastation in Aleppo. You could see in great detail, the craters in the roads and the collapsed buildings. That part is new, but what these images are showing is not: it looks like the destruction in Kabul or Grozny. While General Mladic is on trial in The Hague, we read familiar reports about busloads of men and boys being taken to unknown destinations. The genocides in Rwanda in 1994 and Srebrenica in 1995 have been traumatic for the west, and for Europe in particular. The disaster unfolding in Aleppo differs from Rwanda and Srebrenica in two respects, both of which show that Europe has a steep learning curve. Firstly, Europe has ensured that, this time, no international forces are present who could possibly be considered complicit in the carnage. In Rwanda, UN troops withdrew as soon as the genocide started; in Srebrenica, the UN was easily pushed aside by the killers. This testifies to the ‘wisdom’ of the international community: it is now absent altogether. But it is only physically absent. The west has armed groups such as the Free Syrian Army (largely composed of defected Syrian Army soldiers), and the Syrian Kurds. At the same time, it did not take seriously the Russian interests in the region. As a consequence, the opportunity to limit the scope of the armed conflict was lost years ago. The US and Europe have played a negative role by combining misjudgments with the arming of some of the parties. However, there are no "boots on the ground" and therefore the painful questions (such as: was it really a good idea that the Dutch UN commander in Srebrenica had drinks with Mladic?) do not arise. What we get to see from Aleppo is eerily familiar. When the Syrian regime struck down an uprising in the city of Hama in 1982, between 10,000 and 40,000 people were killed. We know that whether the international community can actually prevent genocide is not certain. Prevention is not always successful. But this time, Europe has ensured that the necessary palliative care is also limited to the minimum. The estimated number of deaths in Syria is now at 450,000. That is, 2% of the population, a very high percentage. Half the Syrian population is in flight, and this is equally unprecedented. The international community left it to the neighboring countries to deal with the millions of refugees. In addition, Europe closed its borders, pressured North-African countries to introduce visa requirements for Syrian nationals, and made the infamous deal with Turkey. As a result, the neighboring countries (Turkey, Jordan and Lebanon) have also closed their borders. At the Jordanian border, some 70,000 refugees are stuck in the desert since months. 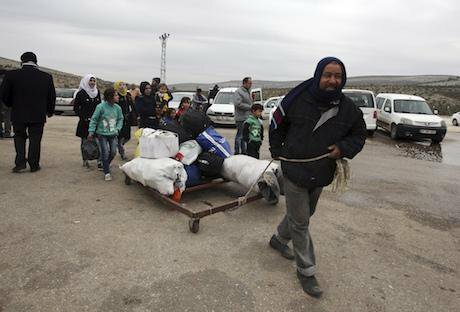 At the Turkish border hundreds of thousands of refugees remain on Syrian territory. Despite its inability to address the Syrian conflict itself, the international community could very well protect victims by offering them refuge. The reverse is happening. Turkey is building walls and fences allegedly with machine guns that fire automatically when they detect movement. This year, Turkish border guards shot at least 163 people. In Lebanon, an estimated one in three inhabitants is a Syrian refugee. This makes the refugee burden per inhabitant there a hundred times more than in the EU. The hypocrisy of the western approach is strikingly illustrated by a photograph circulated by the UN in August, accompanied by a perky press release. The picture shows how a crane lifts supplies from Jordanian territory to refugees who are forced to remain in Syria. Apparently, any physical contact with the refugees is to be avoided, otherwise Srebrenica-like issues of responsibility might arise. The US, Europe and other western countries are unwilling to be physically present in Syria, so they can wash their hands of what is happening there. Dropping band aids from safe heights, that’s about it. The dirty work (such as closing the border so that refugees are locked up in a war zone) is left to other countries. This allows western countries to deny any responsibility. International politicians like Samantha Powers display great consternation about the fate of the people from Aleppo, whose itinerary to their mass graves we can follow live on social media. But two things should be clear: the failure of more effective prevention is partly a responsibility of the leading politicians in our countries. And these same politicians have knowingly locked the emergency exits. Their display of grief and mourning must not distract attention from their co-responsibility for the situation in which this could happen.